In the third book of the Love's Compass series, Finding Courage, Duke and Avalon decide to get a dog. They go to an animal shelter and after much deliberation, choose a German shepherd puppy to adopt. They name their new dog Khanrad. I wrote this dog after a special guy that my husband and I adopted the year we got married. Almost all of the stories about Khanrad in Finding Courage are true, and that's not even half of them! We've had a number of dogs during the course of our fifteen years of marriage, but Khanrad still stands out among the rest. He and I didn't always get along. Ha! When we first got him, we lived in an apartment on the second floor. There was a staircase down to the sidewalk and you could see between the stairs. Khanrad refused to step a paw on them. So many times a day, I would cart this dog down a flight of stairs. We'd walk and wait and he rarely would do his business. Finally, I'd get tired and carry his body back up the stairs. He'd take two steps into the apartment and pee on the carpet. Yes, that was the start of our relationship. Khanrad was definitely my husband's dog. He was devoted to him and saw him as the leader of our pack. I'm pretty sure he considered himself next in line and I landed way at the bottom of the totem pole. Khanrad was a loyal dog who was with us from the time we adopted him in June of 2000 until he passed away in February of 2013. We still miss his presence in our family very much. I look forward to you all reading about his antics in Finding Courage. I will also be sharing some of the other stories that didn't make it into the book over the course of the next month as we wait for Finding Courage to be released. Do you have a dog that's unforgettable? Any funny stories to share? I would love to hear about them! One of the few pictures I have of Khanrad as a puppy. He, and our kitten Candi, napped together. even more to accept one. Finding Courage is book three in the Love's Compass series. As outside pressure continues to threaten Duke and Avalon's fragile foundation, they must find the strength to prove to each other their marriage is worth fighting for. and will be released October 1st! I'm very happy to have Author Faith Blum as a guest on my blog today. She's celebrating her three Hymns of the West Novellas with a fun tour, sales, and a couple of prizes as well. So read on to learn more and make sure to enter the contests at the bottom as well! Don't Miss Out on the Sales! From August 24-28 only, I Love Thee will be free! Also on sale during the blog tour are A Mighty Fortress which will be $0.99 from August 23-30 and Be Thou My Vision which will be $0.99 from August 30-September 6. Timothy is at his wit's end. His twelve year old half-sister has run off five housekeepers in almost a year. Since their parents died, she has grown wilder than ever. What can he do? As he looks for a new housekeeper, his eye catches sight of a mail order bride advertisement. One young lady has a younger sister and sounds like a God-fearing woman. Could this be the answer to his dilemma or will Louise run her off, too? I've read a number of mail order bride stories. Typically, they center around men and women who are single or the couple involved is getting re-married because one spouse or the other has passed away. The widow or widower is then left to care for their child as a single parent. I like how Faith changed it up. Both Timothy and Abigail are raising a younger sibling after their own parents have passed. This makes the story unique and also gives the two of them some common ground to start their marriage off with. I especially liked Abigail. I thought Faith did a fantastic job of developing her character and making her someone we care about immediately. While I found myself wanting to read more about how Timothy and Abigail's relationship developed over time. I think this novella will encourage the reader to check out Faith's Hymns of the West full-length novels. Faith Blum is a 24 year old home school graduate who enjoys doing many right-brained activities such as reading, crafting, writing, and playing piano. Her favorite genre to read and write is Historical Fiction, more specifically, Westerns. In the Hymns of the West series, she has endeavored to create clean, fun, and challenging Western stories for the whole family. She currently has three novels and one novella published or available for preorder. When his sister dies, leaving him with four children ages 8 and under, Cole Baxter gets desperate. He decides he needs a wife. He writes to a mail order bride before realizing he almost through away the best woman he could have. Mail Order bride seeks wealthy Western man. Write Mona Sommers, Pittsburgh, Pennsylvania. Blog Tour Schedule - Be sure to stop by the other sites! Spotlights at Rise, Write, Shine! Finding Peace is a #1 Best Seller on Amazon! It was amazing to wake up this morning and discover that Finding Peace was listed as the #1 Best Seller in Contemporary Christian Romance! It has been an exciting ride this week and seeing this reminded me of how amazing God is and how He can take something that's close to our hearts and use it to reach other people. I want to thank everyone who has bought and read this book. I also want to thank those of you who have posted reviews as well. You guys rock! Alora’s safe world is soon turned upside-down as she’s thrust into another realm where her soulmate waits, magic abounds, and unfathomable evil seeks to claim her. Bound together as soulmates, something compels Alora and Kaevin to abandon the safety of their refuge for the dangers of Kaevin’s realm. The soulmates arrive in the midst of a raging battle as Stone Clan warriors defend their capital, an attack made more deadly by the pervasive evil of her father. Alora and Kaevin face mortal danger as they fight against man and magick to preserve Kaevin’s home and heritage. For Alora’s father will have her allegiance. Or her death. 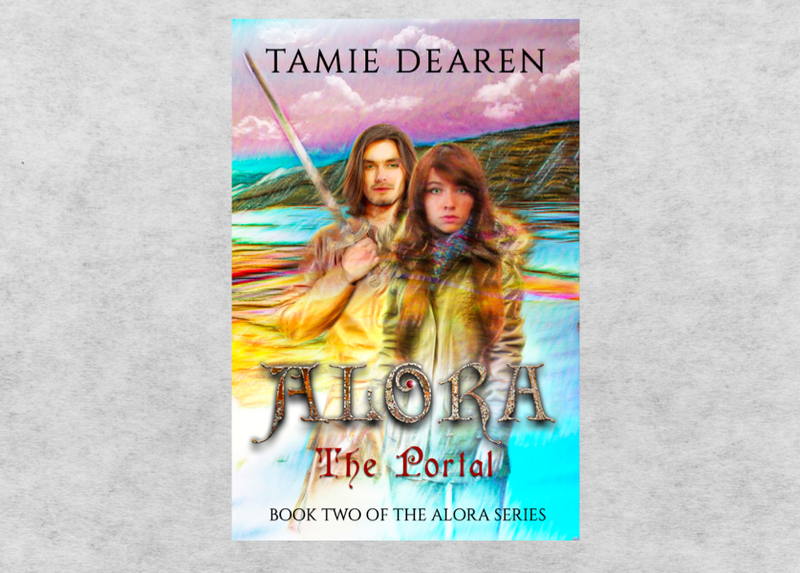 Alora: The Portal is available on Amazon for the special pre-order price of 99¢ through the August 31 release date! 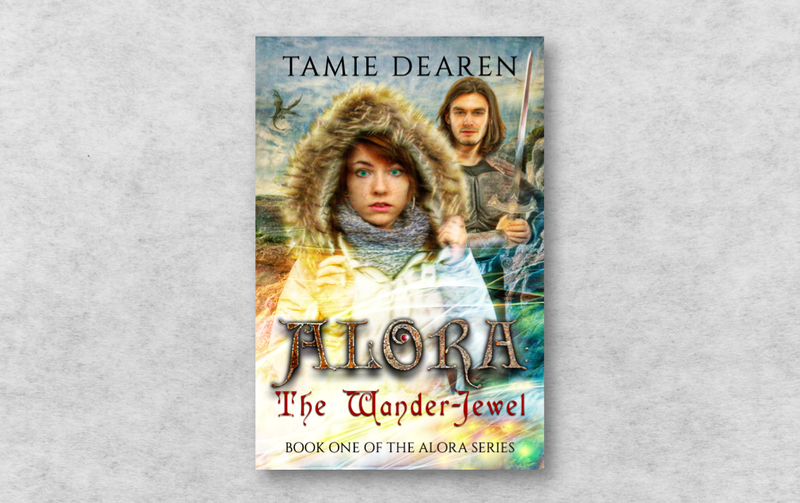 As a bonus, Alora: The Wander-Jewel will be FREE on August 30 through August 31! Find Tamie Dearen on her website, Amazon, Facebook, and Twitter. Alora fought the urge to beat on the tile wall. He’d disappeared again. Who was this boy she kept seeing? Why did he only appear when she was in the shower? He seemed so real, and she could have sworn he looked as confused as she felt. As if he was trying to figure out who she was, as well. Was he a figment of her imagination? His eyes were so unusual. They were green. Not an ordinary green, but a deep, intense jade, the color of her aunt’s emerald ring. He was really cute, although he wore his wavy brown hair a little long for her taste. Yet she could only see his head—never his clothes or the background. Today he’d tied his hair back in a ponytail. Surely the fact he’d changed his hair was significant. Wouldn’t a figment of her imagination have his hair the same every time? She peeked around the shower curtain at the clock on the bathroom counter. It was five a.m. on a Saturday, and she had chores to do, feeding the horses and letting the chickens out. But it was winter, so she had plenty of time to spare before the rising sun tolled the beginning of her responsibilities. Living on a ranch in the backcountry of Montana meant cold winters, lots of work, and little time for leisure. It was the only life she’d ever known, and she usually enjoyed it, despite the heavy work involved. But right now, she wanted another stab at seeing that boy. The image was always so fuzzy. If only he wouldn’t disappear when she opened her eyes. She couldn’t summon his visage at will. He didn’t come every time she closed her eyes in the shower; it seemed to happen when she was relaxing and letting the water beat down on her head and shoulders. Maybe, if she were soaking in the tub, she might see his image again. She pushed the curtain back, put in the stopper, and turned the faucet on full blast. As an afterthought, she added bubble bath, filling the tub with fragrant suds. Soon the bath was full, with aromatic bubbles foaming on top. She eased into the soothing water, closing her eyes at the blissful caress of the heat on her tight muscles. And she waited. Anticipating. Would he come? She tried to stay alert, but the relaxing warmth seeped into her skin, lulling her to sleep. Awakening with a start in the cold water, disappointment formed a knot in her stomach—he’d never appeared. She released some water down the drain and added hot water, swirling it around until the temperature was comfortable again. She had five more minutes before she had to abandon her bath to start her workday. She lay back down, sinking below the water with her eyes closed, swishing the fresh water over her skin to remove the bubble bath film, her face floating above the surface to breathe. enough that his well-formed muscles were evident. She noted his long hair was tied back, as it had been earlier. She could only see the front of him as he stood frozen, stock-still, with his mouth agape, his jewel-green eyes wide and… moving. His eyes were moving, up and down, as if he were scanning her body as she had done. And it occurred to her if she could see all of him, he might be able to see all of her. Lunging for her towel on the floor, she screamed at the top of her lungs. Hastily covering herself and preparing to leap from the tub, she looked up, only to discover the vision was gone—if indeed it had been a vision. My life has been hectic lately and for a variety of reasons. I usually start off impressed with my productivity on Monday, but by the time I reach Friday, I'm exhausted and frustrated with the lack of things I've accomplished. I woke up this morning and found myself putting together a mental to-do list for tomorrow. By the time I'd turned the lights on and gotten something to drink, I was already feeling behind. And my weekend isn't even over yet! I'm willing to bet I'm not the only one who does this. It doesn't matter where we are in life, it's easy to let the busyness of our days make us feel like we're not doing enough. The truth is, life is unpredictable and often messy. And guess what? There's not a lot we can do about it. What does this mean for me personally? Most of the stress I experience through the week is self-imposed. Let me say that again. A majority of the stress and anxiety that manages to dictate my week is created by me. It's completely unnecessary. There's a lot of freedom in that realization. I'm letting feelings of stress and lack of accomplishment color my days. I have the ability to release that and take each day as it comes. It is possible to do my best, enjoy what comes my way, and put it all aside at the end of the day. As I start the new week, I'm going to remember this message. When I begin to feel overwhelmed (because, let's face it, it will happen), instead of trying to hold onto my control of the things around me, I'm going to make a conscious effort to release it and let God hold me. If the day-to-day stress is a constant battle in your life as well, I challenge you to do the same this week. Let's see if it makes a difference! Finding Peace is FREE through Monday. If you pick up a copy and read it, I'd love to know what you think. Kindly leave a review on Amazon or Goodreads. Thank you for your support. I hope you enjoy Tuck and Laurie's story! Drum Roll Please - We Have a Cover! I'm excited to announce we have a cover for Finding Courage, the third book in the Love's Compass series. Isn't it gorgeous? With the hot weather we've been having around here lately, it makes me long for fall, long sleeves, and a big tree filled with golden leaves to relax under. Many thanks to Victorine at Blue Valley Author Services for this beautiful cover. Are you ready for some more news? I've got the synopsis ready for you! It takes courage to ask for a second chance…even more to accept one. For Duke and Avalon McNeil, it was love at first sight. Married within months of meeting, their feet hardly touched the ground until the reality of their haste hit home with startling clarity. Duke's heart shattered when Avalon vanished for nearly three weeks, fleeing their arguments and misunderstandings. Now she's back. He's happy she's home and safe, but he isn't ready to risk everything again when their bond was so easily broken. Avalon's relieved to be home. She's desperate to make peace between them, but returns with a secret. She can't reveal anything to Duke until she proves to him she came back to restore their relationship. Finding Courage (Love's Compass: Book 3) - Coming October 1st, 2015! August has been a crazy busy month around here so far. In fact, I feel like it was the first of the month, I blinked, and now it's the 11th. How is that even possible? Finding Hope, the second book in the Love's Compass series, is on sale through Thursday for only $0.99. If you haven't read the book yet, now's your chance to pick it up at a great deal! I've had several reviews posted by wonderful readers and I'm thankful for all of them. If you do have the chance to read Finding Hope and would like to post a review on Amazon, Goodreads, and/or Barnes and Noble, that would be fantastic. I hope you guys enjoy Lance and Lexi's story! I also finished the first draft of Finding Courage, the third book in the series. I'm currently in the editing process and I'm working on the synopsis this evening. I'll have more information about the book for you all soon. Meanwhile, it's still scheduled for release October 1st! I'm also plotting the fourth book in the series - tentatively titled Finding Faith. This will be Serenity Chandler's story and potentially the last book in the series. One year ago today, I nervously watched as my first novel went live on Amazon. I wouldn't announce it on Facebook until the following day and it was difficult to sleep that night. The story for Calming the Storm formed in my mind some years ago and I wrote a little here and there when I had the chance. Once 2014 began, I decided that was going to be the year that I finally pursued independent publication. I did a lot of research, found a fantastic group called Clean Indie Reads, and talked to a number of people on how best to approach the scary world of indie authors. I had several people read Calming the Storm before I published it. However, it was a completely different thing to release my "baby" out into the world. What if no one bought it? What if they did buy it and they hated it? What if people loved it and I was never able to write another book? Yep, those doubts and many more went through my mind that very first day. I sold six copies of Calming the Storm August 6, 2014 and I was absolutely thrilled! In the last year, I've sold a total of 892 digital copies of Calming the Storm. Did I make the best seller's list? Not even close. But it's been an amazing adventure. Looking back, a lot has changed. I'm much more comfortable with Amazon and how to format my files. I've had three new releases now to get an idea of what kind of promoting works best for the genre I'm writing in. Even then, I'm constantly learning something new and I anticipate that'll always be the case. One thing hasn't changed, however. I'm not sure I'll ever feel at ease releasing a new book into the world. I still want to hold it close and protect it from bad reviews or rejection. I felt that way about Calming the Storm but I'm thankful I pushed through it. This past year has been a huge learning experience, an adventure, and a dream come true. I'm looking forward to seeing what the next year as an indie author has in store! What else can she do if she wants to raise her young niece and give her a more stable home than she and her sister grew up in? Rachel is at risk of losing custody of her last blood relative, and she needs to prove she can provide for her niece and raise her in a nurturing environment. Professor Brandon Barlow is invested in his college students' lives, dedicated to ensuring their success. When it's clear that Rachel is struggling, he takes a personal interest in trying to help her. But can he keep his heart from getting involved in the process?